The Internal Revenue Service (IRS) W-9 form is titled "Request for Taxpayer Identification Number and Certification." This IRS document is designed to collect basic tax information from certain taxpayers, which may be individuals or businesses. First and foremost, a W-9 provides a company with basic information about taxpayers with whom it does business. It allows them to report the amount paid to the taxpayer for services rendered to the IRS. United States citizens and resident alien individuals, corporations, trusts and other types of business entities that do not have taxes withheld from their earnings must complete a W-9, while non-resident alien or foreign individuals would complete Form W-8 instead. If a taxpayer doesn't fill out and return the W-9 or provides an incorrect or incomplete taxpayer identification number (TIN), any funds paid to the taxpayer may be subject to backup withholding. In this situation, the company would withhold 28% of the income due to the taxpayer and send the withheld portion to the IRS. This is the federal agency's way of ensuring that the appropriate taxes are paid, even if the taxpayer is not correctly identified. A business needs to get a W-9 from any individual or company for which it will need to file an information return with the IRS. For example, a business hiring an independent contractor to design the company's new website will likely need to file a 1099-MISC form with the IRS to report how much it paid the web designer. In order to file a complete 1099-MISC, the business needs the contractor's identification information - name, TIN, address, and so on. The business will need to collect a W-9 form from the contractor to obtain that information. Similarly, businesses will often request W-9 forms from corporate vendors so that they have the information they need to report their business expenses as required by the IRS. As with most tax documents, businesses should keep copies of all W-9 forms for at least three years after the last relevant tax return was filed (or the return's due date, if later). In the above example, if the business contracted with the web designer in 2017 and he completed his work before the end of the year, the business should keep his W-9 form at least until April 16, 2021 (assuming the business filed its 2017 tax return on April 15, 2018). The actual W-9 is quite short and relatively straightforward. It consists of three main parts: personal information, TIN, and certification. On line 1, individual taxpayers must provide their name as it appears on their tax return. Even though they are technically a business entity, sole proprietors must put their own legal name in this section. Sole proprietors repeat their name in the second line, which calls for the 'Business Name or Disregarded Entity Name.' Here, they place their full name and the letters DBA, which stands for 'doing business as,' followed by the fictitious name for the business, if any. For example, if John Smith was sole proprietor of Speedy Plumbing, he would fill out the first line as John Smith and the second line as John Smith DBA Speedy Plumbing. Next, the taxpayer checks the 'Individual/Sole Proprietor' box, located beneath the name lines. The taxpayer must also provide his or her mailing address on lines 5 and 6. The client's information can be included on the right side of the form in this area, but is not required. Businesses or other entities must put their legal name (exactly as it appears on their tax return) on line 1. If the business also has a trade name or DBA, that goes on line 2. Next, the taxpayer checks the box indicating how the business entity is classified in terms of its legal structure. You will need to specify if the entity is a C corporation, S corporation, Partnership, Limited Liability Company (LLC), etc. If the business is a single-member LLC, check the 'Individual/Sole Proprietor' box rather than the 'LLC' box. LLCs that have elected an alternative form of taxation (e.g. 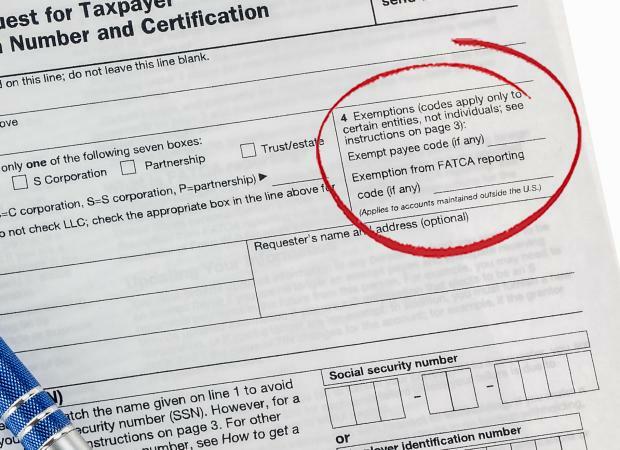 an LLC that has elected to be taxed as an S Corporation) would enter the tax classification code on the space next to the LLC checkbox, as instructed by the form. The entity's main mailing address must be provided in lines 5 and 6. The client's address may also be added in the space on the right of the mailing address section, but is not required. Most taxpayers will leave the spaces in line 4 blank. The first space in line 4 indicates that the taxpayer is exempt from backup withholding. Individuals and sole proprietors will almost never be exempt from backup withholding, but in certain situations corporations are exempt. The payee codes and circumstances are listed on the third page of the W-9. if you qualify for one of these conditions, you would place the appropriate code number in the first space for line 4. The FATCA section of line 4 only applies if you are submitting the W-9 to a foreign financial institution and you are exempt from Foreign Account Tax Compliance Act (FATCA) reporting. In that situation, review the list of codes and reasons on the third page of the W-9 form to see if you qualify, and place the appropriate code letter on the FATCA space in line 4. When in doubt, ask the financial institution requesting the form whether or not you should fill in this space. The last line on the personal information section refers to 'account numbers.' Here, the taxpayer lists any accounts they have with the IRS to pay back taxes or pre-payments for anticipated tax liability obligations. This information is optional and should usually be left blank. The TIN section must be completed regardless of whether the taxpayer is an individual, sole proprietor or business entity. Individuals place their social security number on the right side of the form, in the provided spaces. Sole proprietors and single-member LLCs may use either their Social Security number or their employer identification number (EIN), though the IRS prefers Social Security numbers. Even if a specific individual is responsible for the entity, other types of business entities place their EIN in the provided spaces. In this section, the taxpayer signs the form and attests that the information it contains is true. Failing to provide or knowingly filing false information subjects the taxpayer to penalties. 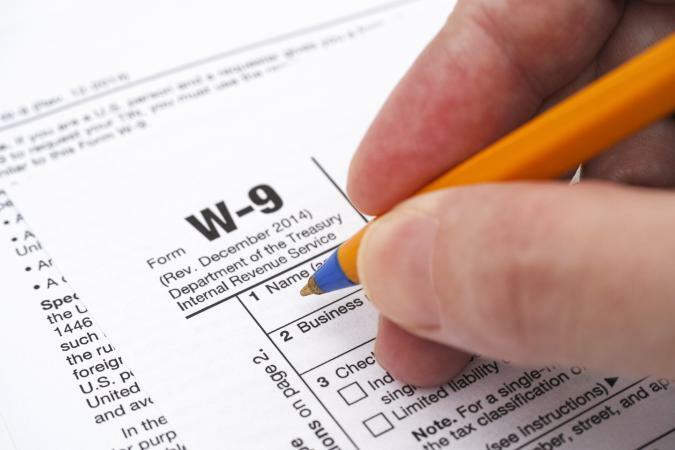 Whether you are an independent contractor or business providing services to a client or if you are a company that hires individuals or business entities to provide services, W-9 forms are critical for tax compliance. Seek professional advice from a qualified tax professional if you have special circumstances or are unsure of whether you need to complete or request this form.